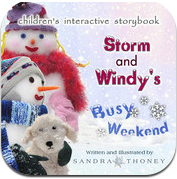 Storm and Windy’s Busy Weekend is a charming tale of two young snowmen, Storm and Windy, who are brother and sister! In the beginning, Krystal, the snow fairy, covers the land with snow. She calls out to the Snowman families, that it is safe to come out now! The action continues with an opportunity for interaction and surprise on each page! Grandma and Grandpa Blizzard even come for a visit. The fun includes sleighing, snow cones, chilly chocolate, Grandma’s cookies, going for a walk in the woods, blowing bubbles, and even building a snowman of their own! There are 4 games at the end of this very interactive story book app. Storm and Windy’s Busy Weekend is illustrated with REAL SNOWMEN created from the finest snow Mother Nature has to offer by the author! You can tap on the paragraphs to be read to. This story is also available in a physical 9×9 soft cover book. 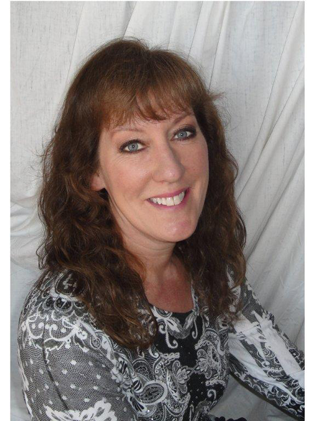 www.sthoneybooks.com Author & Illustrator:Sandra Thoney. Lots of Supplies for Treats! What was the initial inspiration for Storm and Windy’s Busy Weekend? I have always wanted to write a children’s book, but I cannot draw. So what’s a girl to do? Then one winter I thought, “Can I build a snowman?” The answer was, “We’ll see!” So I thought of my storyline and collected props for my snowmen characters. Then one winter day, I went out to play in the snow. Mama and Papa were the first to be created and they turned out pretty good! I took their pictures in different poses, and through the winter I worked on the other characters. Having the illustrations be REAL snowmen! I think that is quite unique and I adore Storm and Windy. The story is simple and seen through the eyes of a child. The app allows the snowmen to “come alive” and move throughout the story. Storm and Windy’s story is written with old-fashion family fun, the way things used to be. Today is so modern and I wanted to bring back the simple pleasures many of us did as children. We didn’t have cell phones or computers, we had to make our own fun by using our imaginations.